With no clear market leader, the U.S market for pharmaceutical plastic bottles demonstrates a highly competitive and fragmented landscape, states a research report by Transparency Market Research (TMR). The market witnesses a high degree of competition between the top players, namely, Amcor Ltd., AptarGroup Inc., Berry Plastics groups Inc., and Gerresheimer AG. 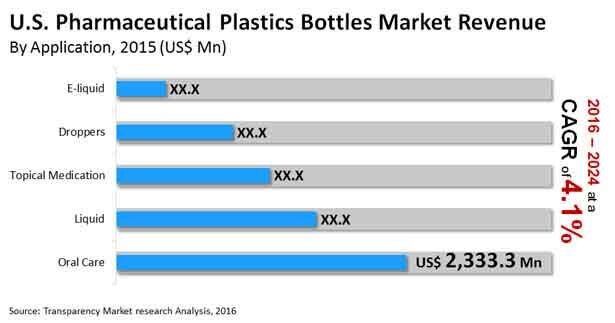 The most prominent share of the U.S. market for pharmaceutical plastics bottles is with the small and mostly unrecognized companies and they are striving to gain more shares with new product launches at a competitive price in the coming years, intensifying the competition within the market. Other significant players in this market are Alpha Packaging, COMAR LLC., Drug Plastics, O. Berk Co. LLC, Pretium Packaging Corp., and Tim Plastics Inc.
As per the research report, the opportunity in the U.S. market for pharmaceutical plastics bottles, which was worth US$6.7 bn in 2016, is likely to rise at a CAGR of 4.10% during the period from 2016 and 2024 and attain a value of US$9.2 bn by the end of the forecast period. Pharmaceutical plastics bottles are likely to find a higher usage in oral care segment than other application areas over the next few years. Packer Bottles to Continue to Attract High Demand in U.S. The report analyzes the U.S. market for pharmaceutical plastic bottles on the basis of several important parameters. One of those is the type of the pharmaceutical plastic bottle, based on which this market has been classified into packer bottles, liquid bottles, dropper bottles, and various other types of bottles, such as Boston round bottle and bullet. Among these, the demand for packer bottles is much higher than other types of pharmaceutical plastic bottles. With a share of nearly 50%, this segment is likely to retain its dominance over the forecast period, thanks to the increasing demand for customized pharmaceutical plastic packer bottles. However, the demand for liquid bottles is expected to increase at a greater pace in the next few years due to the increasing intake of drugs in the form of syrup and solutions, notes the study. “The U.S. market for pharmaceutical plastic bottles has gained immensely by addressing the rising concerns pertaining to sustainability by lowering the environmental impact and increasing the rate of plastics recycling in the pharmaceutical industry,” states the author of this research study. The technological advancements are the key to the growth of the U.S. market for pharmaceutical plastic bottles. The increasing usage of plastic bottles in solid and liquid oral medications has also been fueling this market substantially. On the other hand, the easy availability of eco-friendly alternatives for PE and PET, such as glass, metal, and sugarcane, may hamper the growth of this market to some extent in the years to come. However, the growing popularity of plastic bottle, thanks to the convenience, security, and safety offered by them, is projected to boost the demand for these bottles in this country over the next few years, leading to a phenomenal rise in the U.S. market for pharmaceutical plastic bottles, states the research report. The study presented here is based on a report by Transparency Market Research (TMR) titled “Pharmaceutical Plastic Bottles Market - U.S. Industry Analysis, Size, Share, Growth, Trends and Forecast 2016 - 2024”.